WWII – U.S. Army Air Force 10/1942 through 11/1946: 2nd Lieutenant – National WWII Memorial Honoree. Charles served with the 577th Bombardment Squadron Heavy (H), 392nd Bombardment Group (BG), US 8th AF in Wendling, England as a B-24 Liberator bomber co-pilot of the Trips Daily. 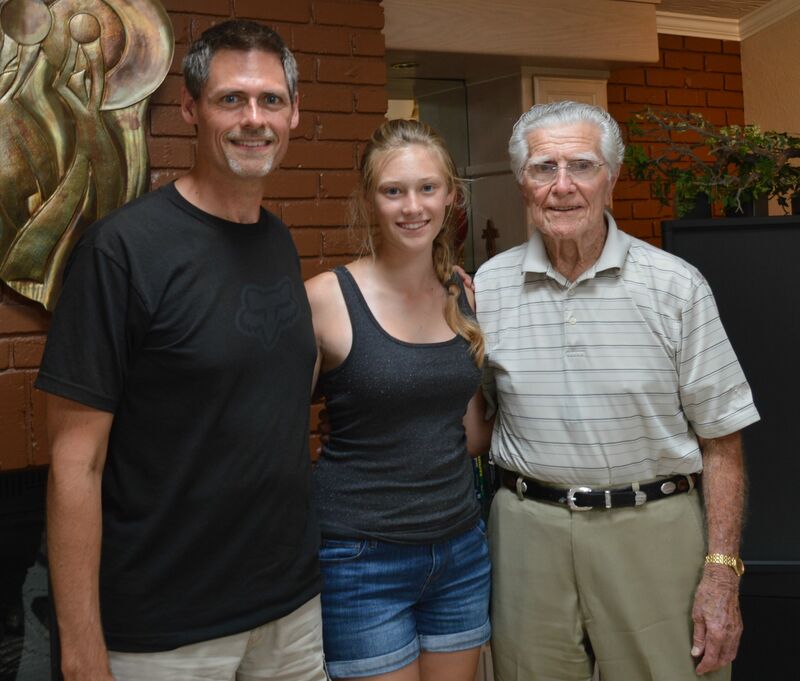 Charles started out as an Insurance Estimator for Lockheed Aircraft while most of his close friends had already been drafted for the war in Europe. Charles entered the classification center at Santa Ana, CA where he passed the physical examinations and was then transferred to Thunderbird Field in Phoenix, AZ to train as an Aviation Cadet with the Air Force. His next post was a small, one stoplight town called Pecos in Texas which had the most advanced school for Multi-Engine Training at what is now the Pecos Municipal Airport. Charles graduated as a 1st Lieutenant and then was transferred to Las Vegas where he towed targets behind B17 bombers for use by fighter pilots as practice. Charles was then transferred to Boise Idaho, Hutchison, Kansas and, finally, New York. Along the way, he was joined by his crew. They soon set sail on a steamer bound for England. 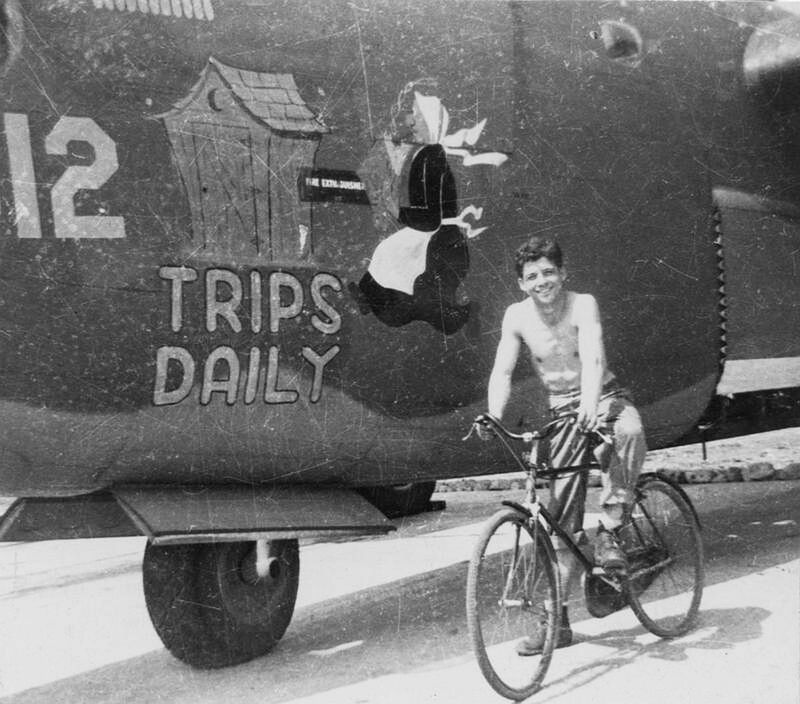 Charles and his crew arrived at the 392nd Bomb Group Air Field where they met their crew chief and ground crew and were assigned a B-24 bomber – the Trips Daily. Charles said that airmen would usually be given the opportunity to fly a couple of missions with an experienced crew before going out on their own. However, this was not the case for Charles and his new crew. Instead, they were to fly a mission the very next day. Click on missions or dates to see mission details. Charles and his crew had successfully completed 15 missions. After 25 they would all be eligible to return home. However, while returning from their 16th mission (63rd mission overall for the Trips Daily) on Saturday, December 2nd, 1944 which targeted marshaling yards important to the German military in Bingen, Germany, Charles and the crew of the Trips Daily, along with five other crews, were shot down (http://www.b24.net/MM120244.htm). The aircraft [Trips Daily] was attacked by enemy fighters about 5 miles past the target [Bingen], as the other 392nd bombers experienced. German Report #KU3469 cited this plane being downed about 3000 meters (~2 miles) east of the village of Merrheim, 12 kilometers (~7.45 miles) from Kirn/Hunsrueck; that it was shot down by fighters and had a mid-air explosion before striking the ground. Three Trips Daily crew members were killed and Charles was captured by the Germans. Charles remained a P.O.W. in the North 3 compound – Barracks 6 (Block 306) – Room 2 of Stalag Luft 1 (short for Stammlager Luft which translates to Permanent Camps for Airmen) in Barth, Germany until May 13, 1945 when the camp was liberated by the Russians. Charles told me that when he was shot down, he bailed out of the Trips Daily and saw a continuous sequence of ground and sky as he was tumbling head over heels and rapidly descending. He decided that he would wait until the last possible moment before deploying his parachute as he had been told that the German pilots would shoot at soldiers as they bailed out of their planes. Charles said that when he finally opened his chute, the force of the sudden stop made his boots fly off. He said that he then saw a German fighter following him as he descended. He decided to start letting air out of his chute so that he could descend as quickly as possible. Charles hit the ground much harder than he expected and was dizzy and disoriented. Within minutes, he was approached by an angry “mob” of German civilians carrying bats and pitch forks. None of them spoke English. However, he was lucky enough that one of the individuals was a well dressed, level-headed schoolmaster who was able to persuade the others not to attack. Charles said that if he could meet that gentleman today, he would thank him for his life. Medals and Honors: The European Campaign Medal with two Battle Stars, the American Area Medal and the WWII Victory Medal. This day would go down in the 392nd’s history as one of the roughest missions ever flown in terms of aircraft and aircrew casualties. It would be the highest attrition the group would ever suffer through the remaining missions of World War II. It was also ironic that on the evening of this date, the 200th mission party celebration for all Enlisted Men of the 392nd was planned. At 0515 and 0640 hours, a total of 18 aircrews were briefed on the target, and at 0930 all began their take-offs. 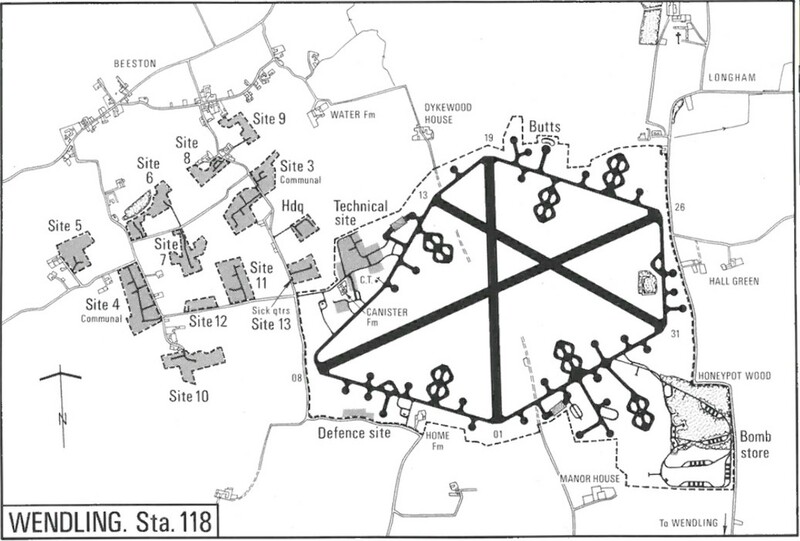 Two squadrons were put up this day, flying high and low formations off of the 44th bomb group at Shipdham. The mission went orderly until the initial point (IP) where heavy clouds were encountered for the start of the bomb run. At this position, the high squadron managed to avoid the weather and bomb the target. The 577th Squadron, flying in the low position, was scattered out just west of the IP but made their bomb run through the clouds. This squadron broke out of the weather right over the release smoke of the lead ship of the 44th which caused a late bomb drop. The group dropped a total of (216) 500lb GPs (General Purpose) bombs in the target area but their problems were just beginning. At the rallying turning point (RP) at about 1244 hours, the 577th was hit by an estimated 50 German Focke-Wulf 190, more commonly known as the FW-109, fighters between Bingen and Bad Kreuznach to the northeast. The fierce attacks lasted for around fifteen minutes with fighters attacking above and below — tail astern (“from the back” or “behind”). The attack was so intense that it was difficult to work out what happened. Six of the 577th crews were lost in this short period. There were only 19 survivors out of the 54 men in the planes that went down. For the families of those who were lost there would be little information about how they met their end. What information did emerge would be scanty, and a long time coming. The aircrews were: Captain H. D. Watkins in #42-50785 (DC – N+); Lieutenant R. J. Cieply in #42-50323 (Heaven Can Wait: DC – D+); Lieutenant G. R. Billingsley in #42-94867 (DC – R+); Lieutenant W. C. Buaas in #42-95012 (Trips Daily: DC – U+); Lieutenant E. L. Comeau in #42-51207 (DC – A+); Lieutenant W. F. Davis in #42-94961 (Alfred IV: DC – Z+). From the 577th, ship #169 also with Lieutenant D. L. Walker’s crew managed to return to land at Manston with (4) crew members wounded. Strangely enough, friendly fighter support for this mission was rated as very good. The remaining ships returned around 1550 hours with gunners claiming (4) enemy aircraft kills. Note: Need to get confirmation from Charles if the fighters were Focke-Wulf Fw 190s or Messerschmitt Bf 109s. 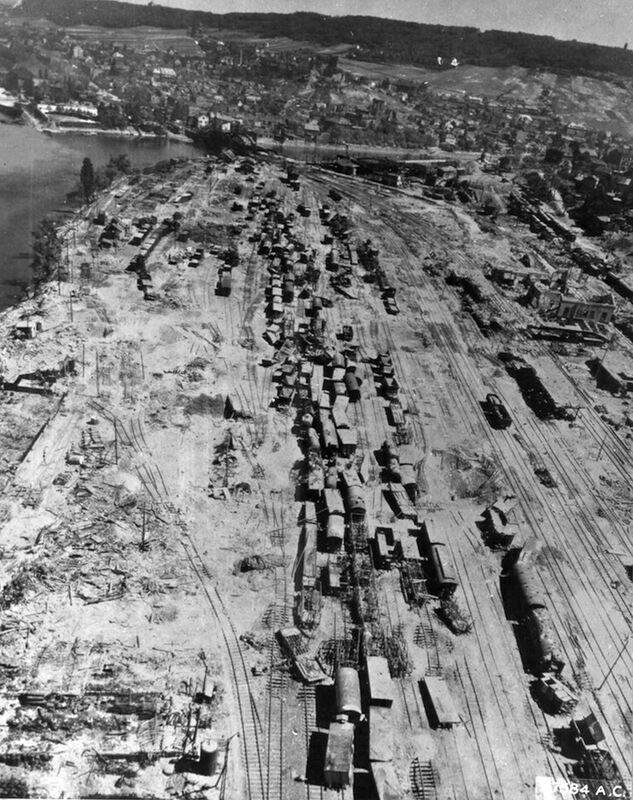 This is the Bingen marshaling yards damage assessment photo taken after mission #207. 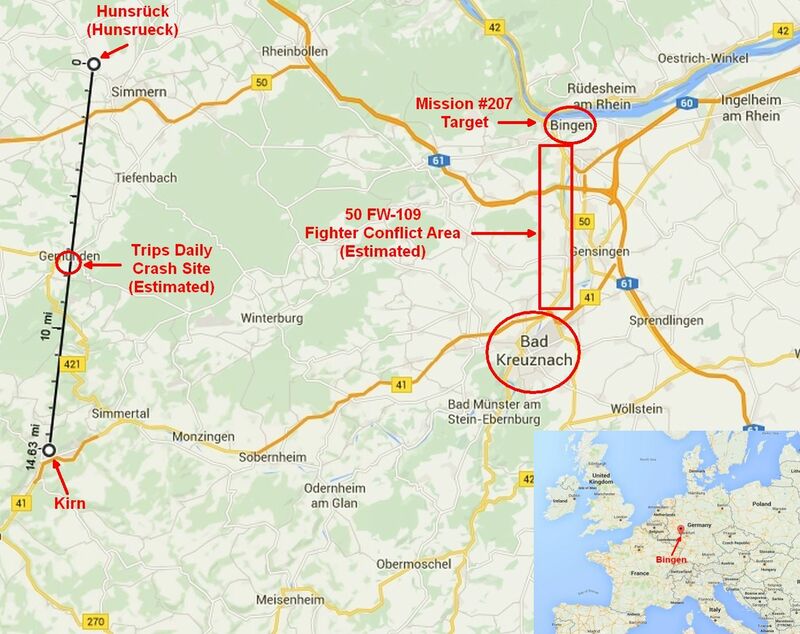 The 8th Air Force Mission #734 had several objectives across Germany. It involved 455 bombers and 604 fighters making GH attacks on marshaling yards and fighter bomber attacks. In this mission, 34-3-7 Luftwaffe aircraft, 11 bombers and 4 fighters are lost. 135 of 143 B-24s hit the Bingen marshaling yard; 1 others hit a target of opportunity; they claim 2-1-1 aircraft; 11 B-24s are lost and 4 damaged; 2 airmen are wounded in action (WIA) and 102 missing in action (MIA). Escorting are 97 of 104 P-51s; they claim 4-1-2 aircraft without loss. 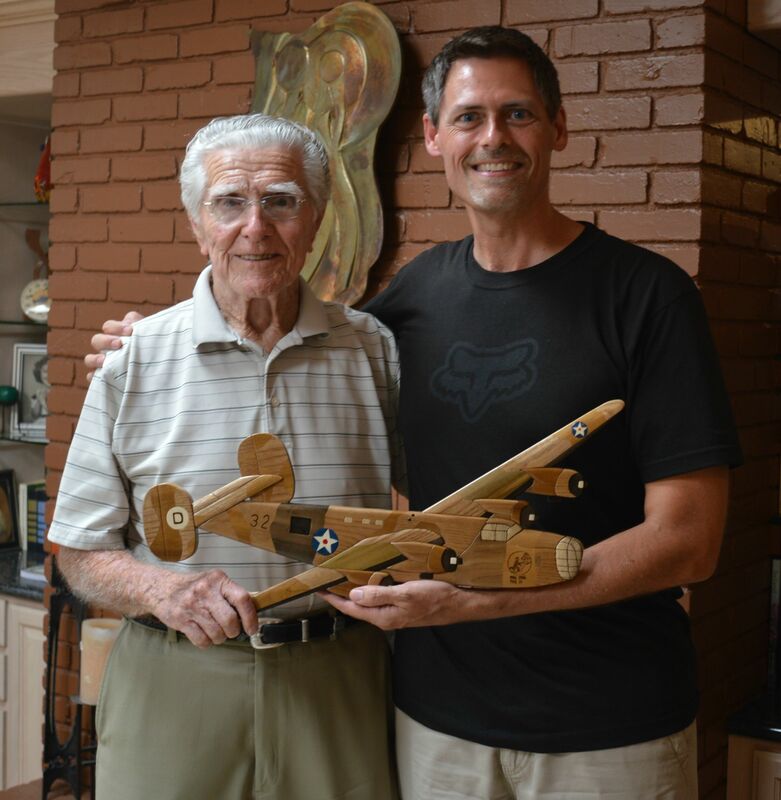 Charles with a B-24 art piece created by his long time secretary who worked with him for 20 years after his service. This is the airfield from which Charles departed for missions over Germany. The airfield was opened in 1943 and was used by the 392nd Bombardment Group (Heavy), arriving 18 July 1943. The “call letters” “U” followed by a “+” were on the Trips Daily vertical stabilizer. Trips Daily nose art. Elderly lady wearing apron, smoking corn cob pipe and holding a store catalog on the way to an outhouse. Charles said that the nose art was slightly different when he flew the Trips Daily as the old woman was replaced by a young boy. Trips Daily and crew. 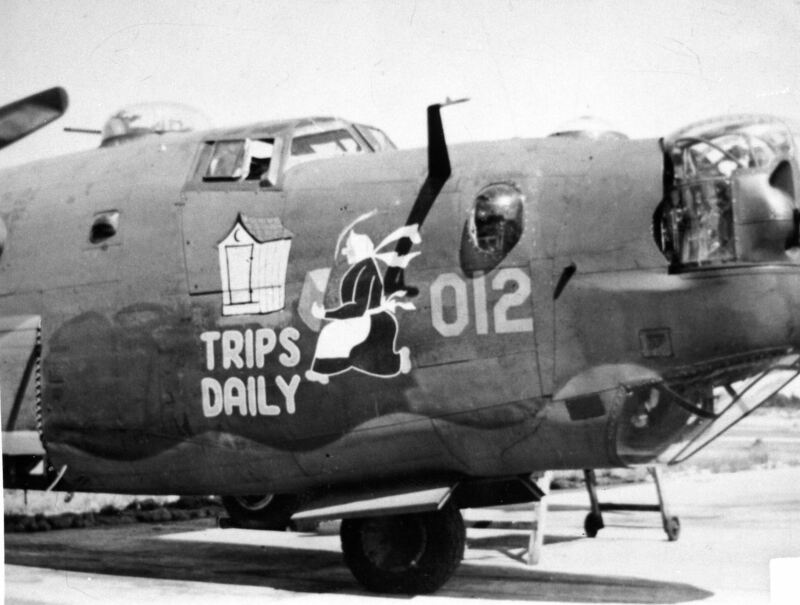 You can see that the Trips Daily had completed 50 missions as represented by the 50 bombs painted above the nose art. Charles was part of the Trips Daily crew starting with mission 45. UPDATE: According to http://www.b24bestweb.com/tripsdaily2.htm, Charles is not in this photo. I also received confirmation from Charles on 9/20/2014 that he is not in this photo. I received confirmation from Charles on 9/20/2014 that he is not in this photo. Unknown crew member of Trips Daily. 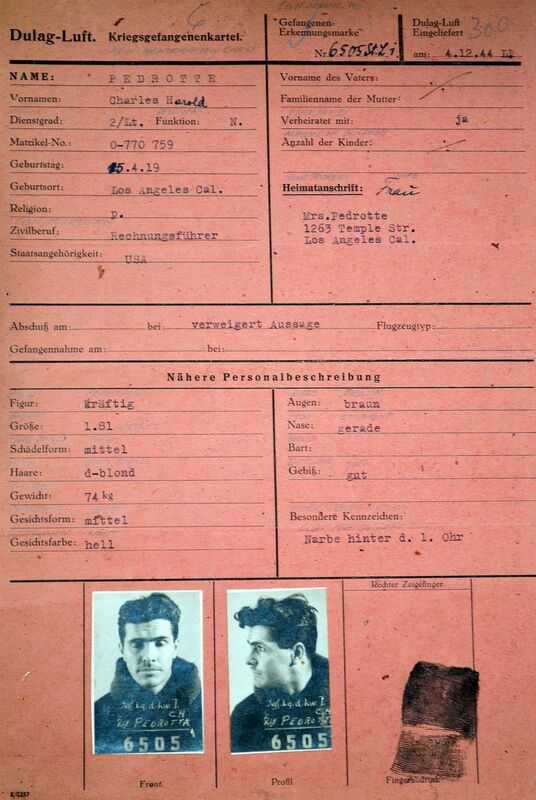 Official Prisoner of War (POW) paperwork kept by the Germans for Charles Pedrotta. Charles was astonished when he found this in an abandoned storage room located at Stalug Luft 1 when the camp was liberated by the Russians. Along with this he found a stack of letters that he had written to his parents while in prison. The Germans encouraged the servicemen to write letters home in hopes that they could obtain intelligence information. The letters were never delivered. Charles personally delivered his to his parents when he returned home. Middle: Charles’ class photo from the class book (Roger-Out) for Advanced Pilot training class 44-C at Pecos Army Air Field, Pecos, Texas, 1944. Note: I will hopefully be able to locate and add a photo of Charles from his days at Thunderbird Field, Phoenix Arizona. 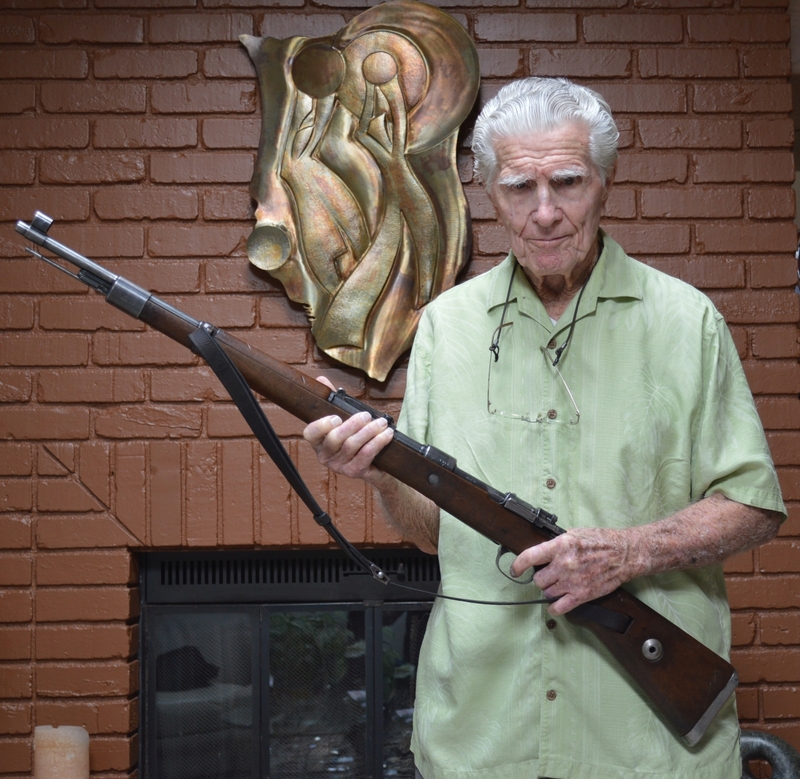 April 2, 2017: CharlesPedrotta holding my AC44 Gewehr 43 (G43), serial number 1582e which was produced in ~April-June 1944. 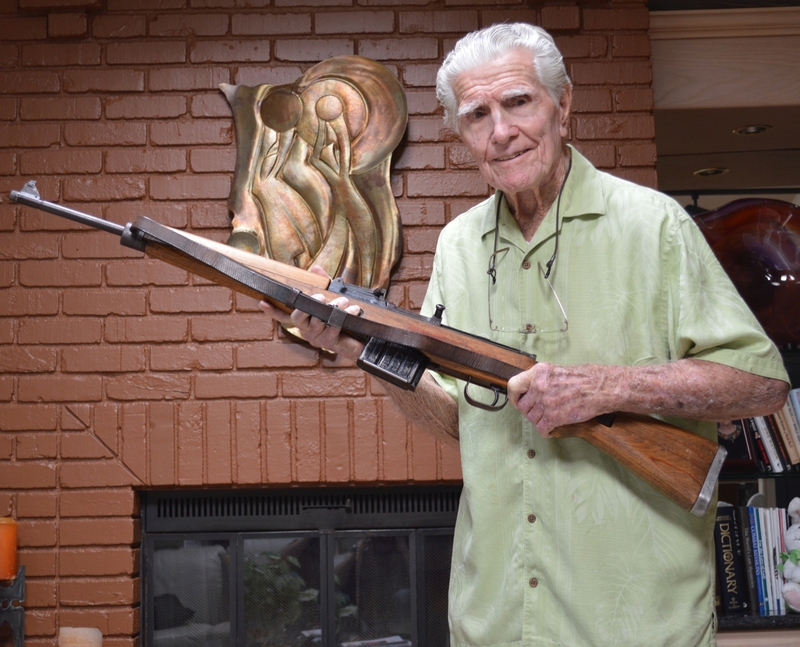 April 2, 2017: Charles Pedrotta holding my byf42 Karabiner 98 kurz (K98k), serial number 2898y. This is the type of rifle that the guards at Stalag Luft 1 would have been using. Charles was born on April 15, 1919 in Los Angeles, California. Charles was in our Rotary Club (Studio City) many years ago. He also was my customer at Glendale Federal. some of the members in Club remember Charles and would like to say hi. If you can please let me know–our Thanks. I was fortunate to know both of his wives (Mary and Peggie) and his daughter Suzi. She lived in Action at the time. Give him a hug for all of us.